SOMETIMES COOKING IS THE LAST THING ON YOUR MIND AFTER A BUSY DAY OF WORK AND KIDS. IT'S EASY TO JUST GRAB WHATEVER IS AROUND, EAT IT QUICKLY AND KEEP ON MOVING BUT THIS IS NOT THE WAY WE SHOULD GO ABOUT OUR DAYS. WE DESERVE TO GIVE OURSELVES THE BEST, ESPECIALLY WHEN IT COMES TO FOOD. IT'S WHAT FUELS US, GIVING US THE ENERGY TO STAY ON TOP OF OUR GAME. 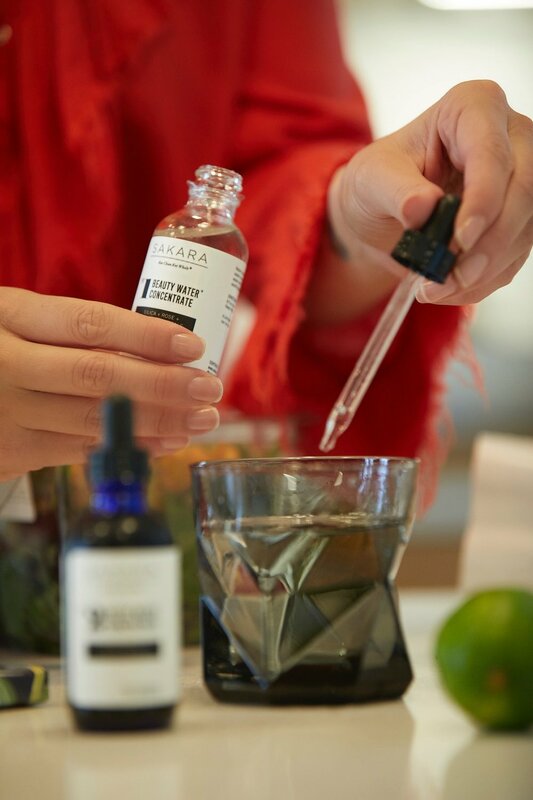 SO WHEN I DISCOVERED SAKARA, I WAS SO HAPPY TO KNOW THAT THERE WERE BUSINESSES OUT THERE TO HELP TAKE THE LOAD OFF. THEY ARE A PLANT BASED MEAL DELIVERY PROGRAM BASED OUT OF NEW YORK. THESE TWO GORGEOUS BABES HAD ONE FOCUS IN MIND, TO HELP YOU BECOME YOUR BEST SELF BOTH PHYSICALLY AND MENTALLY. ORGANIC, GLUTEN-FREE AND DAIRY-FREE WITH NO PROCESSED SUGARS, HARMFUL CHEMICALS, PRESERVATIVES OR ADDITIVES. "...Gluten-free and dairy-free with no processed sugars, harmful chemicals, preservatives or additives"
ONE OF THE PARTS I LOVE MOST ABOUT SAKARA IS THEIR GENUINE FOCUS ON THE MIND/BODY CONNECTION AND HOW OUR THOUGHTS PLAY A VITAL ROLE IN OUR HEALTH AND THE OUTCOME OF OUR LIVES, SOMETHING I AGREE WITH 100%. THEY SAY IN THEIR MINI BOOK, AND I QUOTE THEM "THE THOUGHTS YOU HAVE WHILE EATING AFFECT YOUR DIGESTION AND ABSORPTION OF NUTRIENTS. WE ENCOURAGE YOUT O EAT MINDFULLY--PLATE YOUR FOOD, CHEW THOROUGHLY AND FULLY EXPERIENCE THE TASTES, TEXTURES, COLORS AD AROMAS. SAY "THANK YOU" AT THE END OF EACH MEAL". "Say thank you at the end of each meal"
WHEN WE DON'T EAT THE FOODS THAT OUR BODIES ARE MEANT TO DIGEST, LIKE PROCESSED FOODS, ARTIFICIAL SUGARS, PRESERVATIVES AND TRANS FATS OUR BODIES BEGIN TO DECLINE. IT BEGINS TO ACCUMULATE ALL THE BAD AKA TOXIC BUILDUP, OUR BODIES ARE MEANT TO DETOXIFY ITSELF EVERY DAY. WHEN WE EAT THE WHOLE FOODS WE ARE MEANT TO, WE THRIVE. OUR BODIES CAN DETOXIFY THE WAY IT NEEDS TO, WE FEEL LIGHTER, WE HAVE MENTAL CLARITY, OUR SKIN IS VIBRANT AND WE ARE OVERALL HEALTHY AND FIT. IT'S NOT JUST A FAD GUYS, IT'S SCIENCE. SO TAKE OF YOURSELF AND ALWAYS EAT CLEAN. TRY SAKARA AND LET ME KNOW WHAT YOU THINK. BE SURE TO TRY THEIR BEAUTY CONCENTRATES (SERIOUSLY AMAZING) DETOX TEA AND BARS. OH, I FORGOT TO MENTION THEY INCLUDE A PALO SANTO STICK WITH YOUR ORDER..REALLY? JUST AMAZING.